BEIJING - For decades, people have become accustomed to seeing parterres on Tian'anmen Square during the festive seasons, such as the National Day holiday. Lan Hailang, 36, a major designer of the parterres on Tian'anmen Square since 2000, and his eight team members know all too well that seeing is quite different from doing. "Our job is to reflect the country's development and major events with the flower terraces, and to create a festive atmosphere for people who visit the square," Lan said. "It can be very complex." Along with selecting the colors and arrangement of flowers for the parterres, Lan and his team have to take into consideration changes in fertilizer, temperature, sunshine, rainfall and even wind speed to ensure the duration - sometimes as long as six months - of the displays. 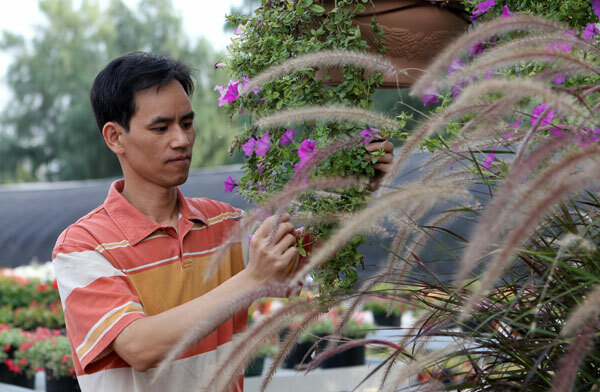 "You can't just change the flowers every day," said Lan from the Beijing Florascape Company under the municipal commission of urban planning. "They must always be alive and blossoming." A graduate in urban landscape design, Lan joined the company in 1997 and since 2000 has led the team responsible for the city's parterre designs, including those on Tian'anmen Square since 2000. China has created a tradition of decorating Tian'anmen Square with flower terraces since 1986. "The flower designs have evolved over the past decades from the simple lining of flower pots in the early years to vivid plant sculptures over the past decade," Lan said. While the arrangement of flowers for the National Day is usually not carried out until August, preparations usually begin at the end of the preceding year, when flowers are planted in suburban fields. The design team makes five different plans in May. The company committee then chooses one of them to present to the municipal authority for further modification. "We often amend the plan more than 10 times, from hammering the style to changing every detail," Lan said. The flower terraces on Tian'anmen Square usually consist of a major formation in the center with a series of smaller ones lining the east and west sides of the square. "The most challenging job throughout my career was in 2008, the year Beijing hosted the Olympic Games," he said. In 2008, besides the traditional decoration on Tian'anmen Square for the National Day holiday, Beijing also held the Olympic Games in August and the Asia-Europe Summit in late October. So local authorities required Lan's company to display different flower parterres mirroring the varied themes of the three events. "The biggest challenge was to ensure the blossom on the flowers lasted as long as six months," Lan said. Beijing has a sultry summer. There are plenty of rainstorms and the temperature typically drops abruptly with fresh gales in late October. As a result, Lan and other engineers started experimenting in late 2005 to find breeds that are capable of resisting both heat and rainfall. The chosen breeds also had to provide sufficient colors for the designers to express details in the sculptures. In 2009, when the country celebrated the 60th anniversary of the founding of the People's Republic of China, Lan's team faced a huge challenge with the unprecedented number of plant sculptures required. Chang'an Avenue alone exhibited 22 large flower terraces, using up to three million pots of flowers. And 40 million pots were laid out across Beijing, nearly 60 percent of the total number of flowers used in National Day celebrations from 1986 to 2005. "We had to design dozens of flower terraces on the Chang'an Avenue, in major parks and on the green areas along the expressways," Lan said. "We also had to make sure none of the patterns were repeated." To accomplish such a feat, Lan collected more than 100 designs from folk designers and modified some of them. "Comparatively speaking, this year is kind of easy for us since there is only routine celebration (for the National Day holiday)," Lan said. Although the parterre on the square has been completed, Lan can't sit back on his laurels and relax. He is now occupied with the International Horticultural Exposition, which is due to start on April 28, 2011 in Xi'an, capital of Shaanxi province. He is also busy working out the designs for the exposition, which is a platform for the world's top landscape gardeners. "I believe my team can outdo ourselves," Lan said.